Summer is upon us! But you're probably wondering: Who offers free wifi and copious air conditioning? What's the most edifying place I could park the kids? Where could I discreetly conduct some light criminal activity? The answer, of course, is your public library. Found next to the wall of the library, police found bottles of Coleman Fuel, lithium batteries, tubing, and several bottles of unknown liquids.... Police determined King had been living outside the library manufacturing meth for about one month. His girlfriend, Stolz, would help him by getting materials for him to cook the meth with. Meanwhile, in Massachusetts, a woman has been arrested for soliciting at the Tewksbury Public Library. WBZ-TV reports a plainclothes detective went to check out reports that someone was working the stacks. He says sure enough, he was promptly approached by a woman with pen and paper. They passed notes until, allegedly, she propositioned him. "It was a little scandalized," said Pamela Gardner, who is a librarian over in Wilimington, but agrees the location is unexpected. "That's a little upsetting, in the library!" There's been a series of library assaults in Oakland, California. 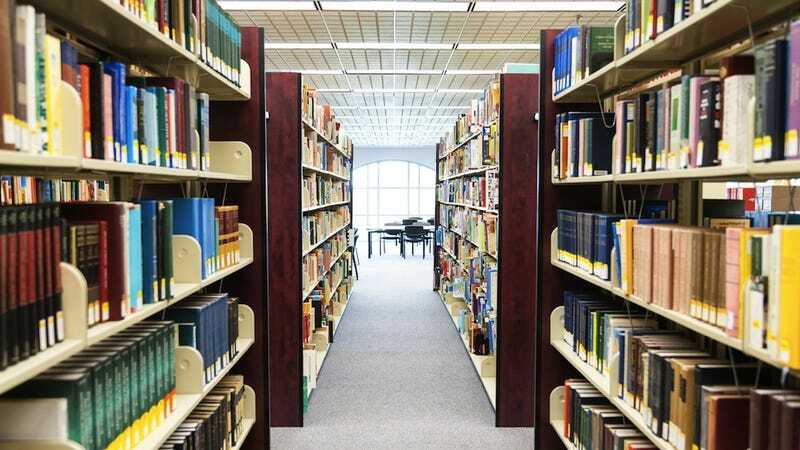 A city employee in Connecticut was recently arrested for stealing $170,000 from her local library. In Dallas, someone burgled the same branch six times. And of course let's not forget the monster who stole a TURTLE from the kids' reading room of the Fall River Public Library. Andrew Carnegie would be so very, very disappointed.